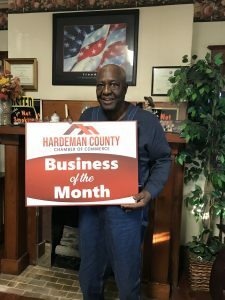 The Hardeman County Chamber of Commerce Business of the Month is Cobb and Associates Tax Services. Vietnam veteran, Elmer Cobb, is owner and operator of this local business. In 1991, Cobb began offering bookkeeping and tax services part time. He grew his business by leveraging his education and strong work ethic. His office is located at 414 West Jackson Street in Bolivar and is now staffed by four employees. Cobb is the former Mayor of Toone and a former County Commissioner. At Clover Chapel Baptist Church he serves as a Deacon, Sunday school teacher, and finance officer. Cobb is a motorcycle enthusiast and also enjoys gardening and fishing in his leisure time. Please join us in thanking Mr. Elmer Cobb for his contributions to the Chamber, to our community, and for his service to our country!